Fill a large stockpot with bones and vegetable scraps. Cover with water and add 2 tablespoons of vinegar. Allow pot to sit on counter for one hour. Place on burner, bring to a boil for 10 minutes, reduce to simmer, cover and leave on stove for 24-48 hours, adding water as needed OR place in crock pot, and leave on high for 1 hour and reduce to low for 48 hours. Add the bunch of parsley or cilantro in the last hour of cooking. Strain broth in a colander and discard solids. Store the broth into quart size jars and place in the refrigerator. After it cools, you can either skim the fat off the top or leave the fat and place lids on the top and freeze. Some people dislike the taste of the broth when the fat is left in, so take it out, but this is not required. 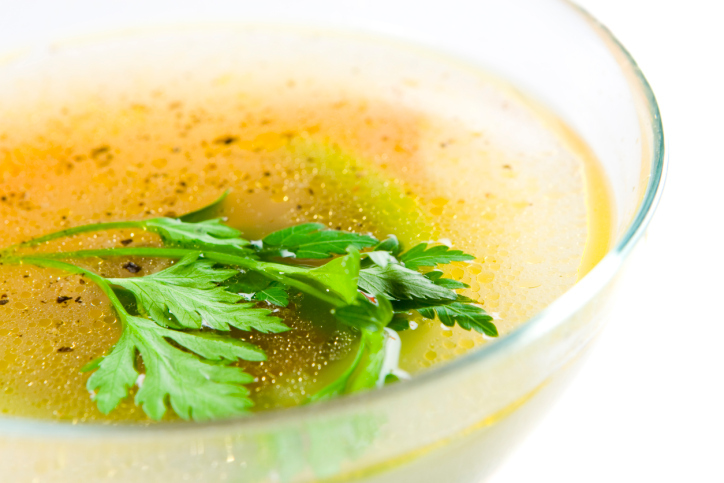 Broth can keep in the fridge for up to one week or in the freezer for six months. Drink at least one half to one cup per day or use in place of water in soups, casseroles, etc.